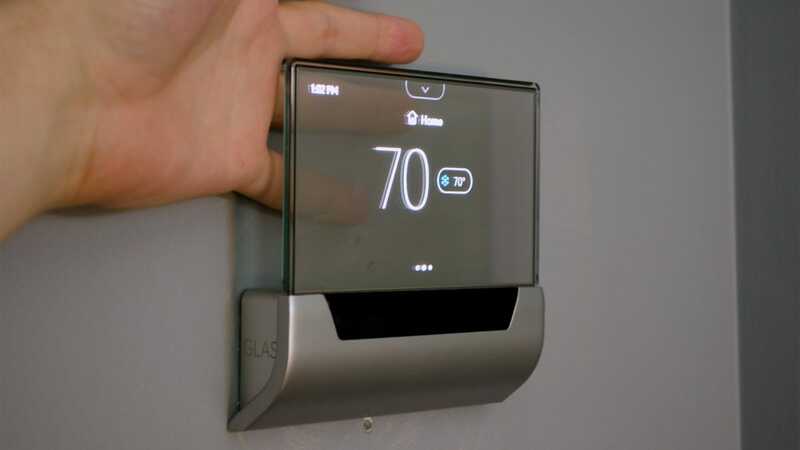 The GLAS thermostat, from HVAC company Johnson Controls, is very similar to competitors from Nest or Ecobee. It can automatically adjust your thermostat on a schedule, detect when you’re at home and turn off the heat or AC to save you money, and even lets you control the temperature with voice commands from Google Assistant or Alexa. It’s also one of the few devices to come with Cortana built in, but if we’re honest you probably don’t care about that—despite Microsoft’s efforts to throw their hat in the smart assistant ring, Cortana isn’t exactly a household name. If you don’t have a C-wire, get ready to climb into your attic to install one of these. As the saying goes, beauty is pain, and the GLAS thermostat lives that to the fullest. Compared to other smart thermostats, installation of the GLAS can take anywhere from a couple extra steps to a bunch of additional time and money. How much of a hassle it is depends entirely on your current setup. 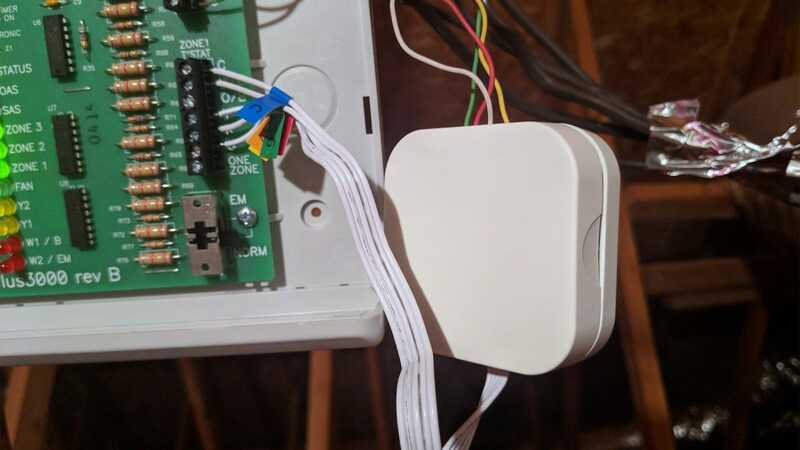 First up, if you don’t have a common wire (or C-wire) in your existing thermostat, then you’ll need to patch in the included power extender adapter. 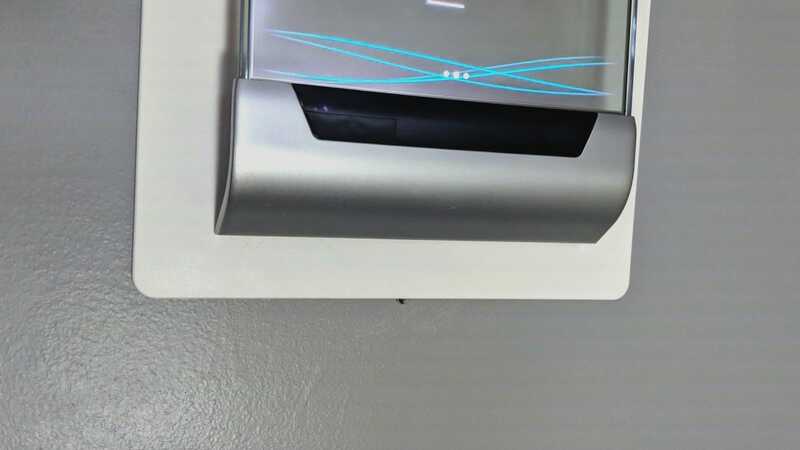 This little white block needs to connect directly into your HVAC system, either on the unit itself or the nearby control board. In my case, I didn’t have a C-wire, so it was into the attic I went. My specific system controls two zones separately from a single board, so it was even more complicated to figure out exactly where to patch the power extender kit into. It’s worth pointing out that if you use the Ecobee thermostats, you’ll run into a similar issue. Nest claims that its thermostats don’t need a C-wire to maintain power, and while this was true of my own system, there are exceptions. In some systems, the Nest could end up turning your system on when you don’t need it to gain power. So, overall this power extender kit is a problem you’ll face with most thermostats if you don’t have a C-wire, but if you’d rather avoid it entirely, Nest may be the way to go. If you do have a C-wire, however, you’re in luck. You can skip this annoying step. Even with the wall plate installed, some of the leftover holes in my wall were still exposed. However, the GLAS does have one unique problem. While the hardware has an attractive design, it also feeds all the wires from your wall into the very bottom of the device, which only consists of a small strip of plastic that’s flush against the wall. The included wall plate is also designed to only cover the area behind the thermostat. That means there’s a decent chance that you can end up with visible holes in your wall. 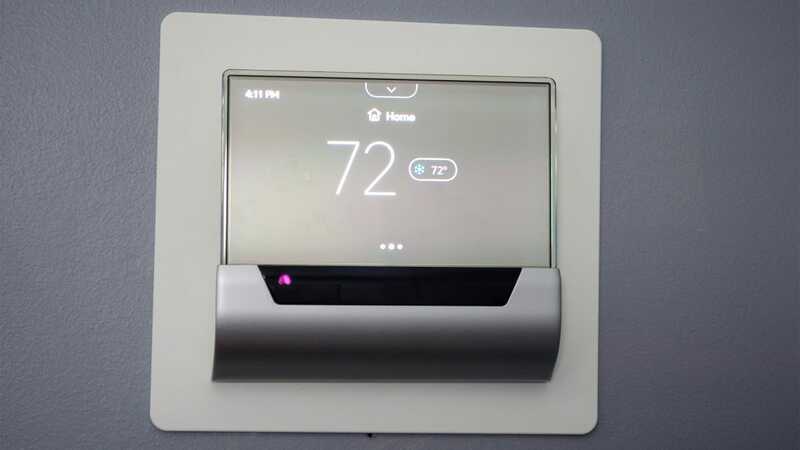 Personally, I like the look of a slick thermostat directly on the wall (though some designer plates can be pretty attractive), but I accept them because I don’t feel like patching holes. In this case, however, since many thermostats feed the holes into the center of the device, screw holes can be found equally far away in every direction. Since the GLAS feeds wires towards the bottom of the device, the wall plate doesn’t cover a symmetrical area. You may not have an issue—admittedly, the previous owner of my home left behind a bunch of unnecessary, probably errant screw holes—but I did have at least one hole still uncovered, and a small area of the wall that wasn’t quite fully painted. Is there a reason for a transparent display? No. Does it look cool? Heck, yeah. Since I was just a little unlucky in my home’s setup, it took a lot of time and effort to install the GLAS thermostat. All that effort felt worth it when I first fired it up, though. The display is strikingly bright, and since you can see through any part of the OLED display that’s not lit up, the bright areas demand your attention even more. I tried the GLAS thermostat with and without the wall plate and on my gray walls, the display looked even better. The bright white text stands out from my darker wall more than it does from the wall plate. If we’re honest, there’s not much reason for the display to be translucent other than the cool factor, but if there’s a practical benefit, this is it. If you have painted walls that are anything other than a pale white color, then your thermostat could end up looking even better. Of course, the downside is that you won’t be able to use the wall plate, which means there could be even more holes in your wall that need to be patched. For the most part, the GLAS’s interface is designed to be as transparent as possible. Nowhere is this more apparent than when you try to set up Cortana (more on that word “try” in a bit). Since signing into Cortana uses the standard UI design that Microsoft provides, the display turns a blinding white, with black text on top. While it’s briefly annoying that the Cortana sign in page isn’t really optimized for a transparent display (and it’s unclear if it even could be), it reinforces how much attention was paid to this detail everywhere else in the interface. The fact that the display is a touchscreen is also a welcome change of pace. When you inevitably need to log into an online account, a virtual keyboard appears so you can type in your username and password. Compared to the Nest’s scroll wheel method of text input, this is a welcome change. It’s not exactly as easy as, say, pairing through your phone the way services like Hulu handle it, but it’s still a nice touch. 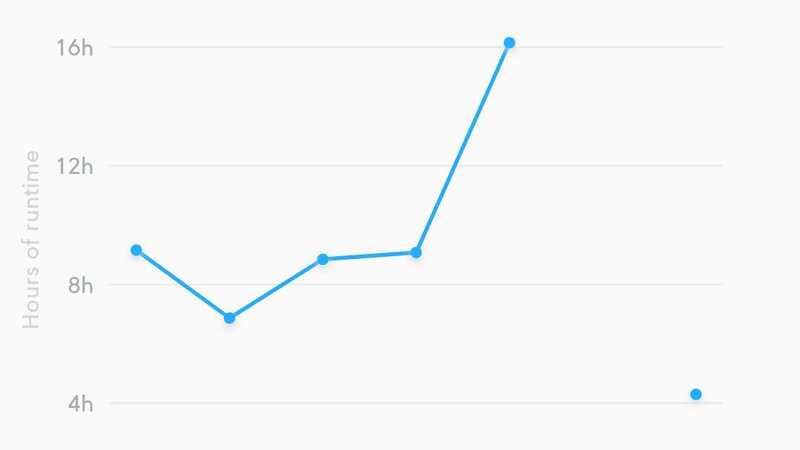 Runtime history charts are handy, but they’re not much different than what you get from other thermostats. When it comes to how well the GLAS performs at smart home functions, well… it’s a good thing it’s pretty. The defining characteristic that sets the GLAS apart (aside from the display) is Cortana support. As voice assistants go, Cortana is a step up from Bixby, but not much else. Still, it’s not just Cortana-compatible, it’s a standalone voice assistant. That’s gotta count for something, doesn’t it? Well, it would, if I could use it. The setup process for Cortana was a little confusing, but you have to start by logging in on the GLAS itself. No big deal. Then, you have to download the Cortana app on your phone or PC and log into that. Okay. Once I did that, there’s a section of the Cortana app where you set up devices and it didn’t detect that the thermostat was available. I tried to connect for about fifteen minutes and it never detected it. A help link just directed to the GLAS website. I don’t exactly need an advertisement for the thermostat I just installed, thanks though. I could’ve tried harder to get Cortana working but I already have multiple Google Assistant devices within earshot of my thermostat and frankly, we recommend either Google or Amazon’s voice assistants for smart home stuff these days. Fortunately, GLAS supports both of these, so you can control your temperature with just a voice command. The Google Home controls work about as you’d expect. Ask it to turn the temperature up, it goes up, turn it down it goes down. You can ask it to turn the heat on, turn the AC on, or just run the fan. This is about what you’d expect from any other smart thermostat, but it’s good to know that it works as advertised. 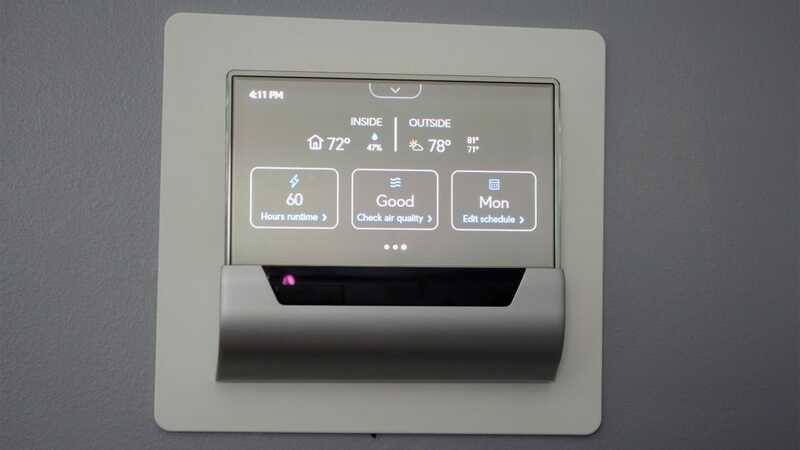 Beyond voice control, the GLAS also generates charts that show uptime for your heating and cooling units, so you can see how long they’ve been running, which other thermostats can do, too. It also features an ambient sensor that can detect when you walk by and automatically turn off if it doesn’t see you for a while which, again, other thermostats can do. In my home, the thermostat is tucked in a corner where it wouldn’t see most people walking by, so I turned this feature off, but if your thermostat is located in a busy room, this is a nice, if fairly standard feature to have. Ultimately, “fairly standard” is an accurate descriptor of most of the GLAS’s features. While that might say more about what counts as “standard” here in 2018, it still doesn’t do the GLAS many favors. Put simply, if all you care about is what your thermostat can do, there are probably cheaper options out there that do the same thing. While the GLAS performed serviceably, it’s hard to say that it does much better than any other smart thermostat. 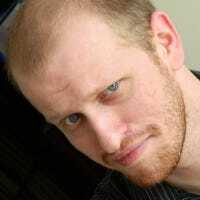 Cortana integration probably won’t appeal to many people, and Google Assistant or Alexa support is the baseline you’d expect from any smart gadget. Detecting when you’re home and adjusting your HVAC on a schedule are also pretty standard features. There are also cheaper thermostats out there. The GLAS sells for $320, which is a somewhat high premium over competing thermostats. And that’s without getting into the discounts that your energy company might give you for buying a different smart thermostat. Despite all that going against it, there are very few thermostats that look as good as the GLAS. Heck, there are very few consumer devices out there with a translucent OLED display at all. If you want your thermostat to be a conversation piece, this is certainly the way to go. And it is quite the conversation piece. You might want to do the extra work to patch the holes in your wall to make it look as good as possible, but for the effort, it will look really good.